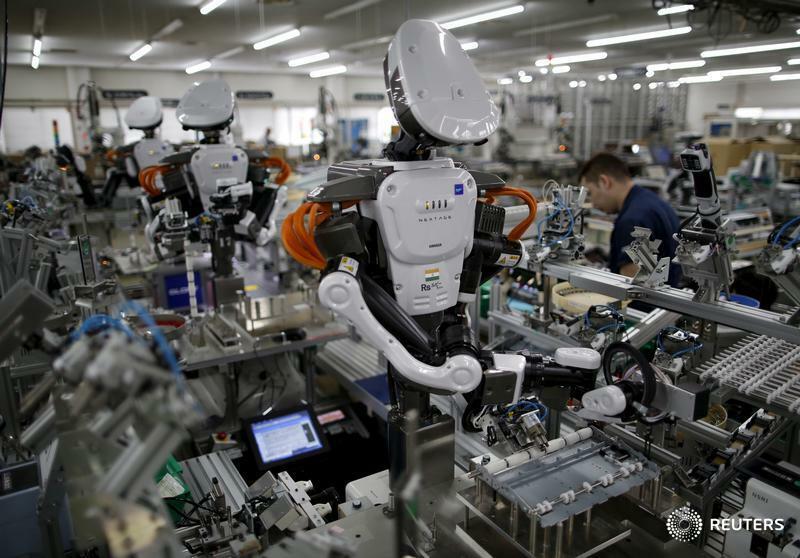 TOKYO (Reuters) — Desperate to overcome Japan's growing shortage of labour, mid-sized companies are planning to buy robots and other equipment to automate a wide range of tasks, including manufacturing, earth-moving and hotel room service. According to a Bank of Japan survey, companies with share capital of 100 million yen to 1 billion yen plan to boost investment in the fiscal year that started in April by 17.5 per cent, the highest level on record. "The share of capital expenditure devoted to becoming more efficient is increasing because of the shortage of workers," said Seiichiro Inoue, a director in the industrial policy bureau of the Ministry of Economy, Trade and Industry, or METI. If the investment ambitions are fulfilled it would show there is a silver lining as Japan tries to cope with a shrinking and rapidly aging population. It could help equipment-makers, lift the country's low productivity and boost economic growth. The government predicts investment in labour-saving equipment will rise this fiscal year, Inoue said. The way Japan copes with an aging population will provide critical lessons for other aging societies, including China and South Korea, that will have to grapple with similar challenges in coming years. "More than 90 percent of Japan's companies are small- and medium-sized, but most of these companies are not using robots," said Yasuhiko Hashimoto, who works in Kawasaki Heavy Industries’ robot division. "We're coming up with a lot of applications and product packages to target these companies." Hitachi Construction Machinery says it is getting a lot of enquiries for its computer-programmed digging machines that use a global positioning system to hew ditches that are accurate to within centimeters and can cut digging time by about half. "We focus on rentals and expect business to pick up in the second half of the fiscal year, which is when most companies tend to order construction equipment for projects," said Yoshi Furuno, a company official. Hitachi Construction declined to provide figures. Mid-sized companies are planning on increasing spending much more than large-caps, which are projecting just a 0.6 per cent increase in the fiscal year, according to the Bank of Japan. Smaller companies tend to have less flexibility in overcoming labour shortages by paying workers more or by moving production overseas. Some companies could end up spending less than originally planned. But with demographics only worsening, companies will need to continue to search for solutions to the labour shortage problem. Japan's working-age population peaked in 1995 at 87 million and has been falling ever since. The government expects it to fall to 76 million this year and to 45 million by 2065. In the fiscal year that ended March 31, 2016, mid-sized companies with 100 to 499 workers advertised to fill 1.1 million new positions, the highest in five years and almost five times the number of open positions at companies with 500 workers or more, Labour Ministry data show. Among the robot makers to report stronger revenue in the last quarter was Fanuc. Its revenue was 7.9 percent higher than a year earlier, the first increase in seven quarters. Meanwhile, Yaskawa Electric’s revenue grew 5.1 percent in January-March from the same period a year ago, the first increase in five quarters. Robots and labour-saving gear aren’t just found in manufacturing and construction. They are also being sought by property developers, food and beverage makers and hotel chains. The Hen na Hotel, or the "Odd Hotel," near Tokyo Disneyland, for example, bills itself as a robot hotel because it uses 140 different robots and artificial intelligence to serve guests in its 100-room hotel and can operate with as few as two to three people, according to the manager Yukio Nagai. Each room contains an egg-shaped robot, or personal assistant, called Tapia, that uses artificial intelligence to recognize people's faces and respond to their voice commands. It can wake you up, manage your schedule, and control other Internet-linked devices like the TV and air conditioning. Other robots can carry bags and take out the trash. "Companies say they are interested in Tapia because of labour shortages. Nursing homes are also interested," she said. "We'll continue to sell this for use in the home, but all the interest from companies show that the market has shifted somewhat."